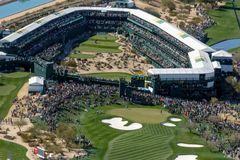 Home to the famous 16th stadium hole, which is setup with its incredible grand stands during the PGA Tour's Phoenix Open. Located in the Sonoran Desert, and under the gaze of the majestic McDowell Mountains, the Tournament Players Club (TPC) at Scottsdale is among the most spectacular courses in the United States. We found 1 offer matching your search. Every year The Phoenix Open - comes to town, and is the perfect showcase for this magnificent layout. Not only is it the PGA Tour's best attended event, but its short 16th hole is definitely the most raucous in spectator golf, where the fans let loose as soon as every ball takes flight. The course measures 7,216 from the tips, and is ranked in Arizona's top 25, and the world list of the 100 best golf resorts. The Stadium Course is incredibly popular, and is the ultimate example of the terrific desert golf that has made Scottsdale so famous. Formerly known as the Desert Course, the TPC's Champions Course was officially unveiled in 2007. Designed by Randy Heckenkemper, the course is not the rival of the Stadium in terms of fame, but it is equally as beautiful and just as challenging. Another 'must play' for any Scottsdale golf holiday.